DU hosted their final home game today with celebrations of Senior Day and sideline entertainment from cheerleaders and dance teams. The team seemed to come out of the locker rooms sleepy on offense, missing numerous opportunities. However, whatever Tierney said to them at halftime worked and the Pioneers came out in the second half thundering. Providence scored the first two goals on the day with efforts from Michael Perettine and Conner Byrne, both off assists. The entire first quarter was full of aggressive defense and back and forth turnovers. It took almost twelve minutes for the first goal to happen, and another two and half to follow. This led DU to be scoreless in the first quarter. Ryan LaPlante made a huge save in goal and came stampeding out coast to coast for an attempted shot that would be stopped. Denver’s defense was able to break up the fast break and allow LaPlante time to get back to cage. This was the start of a momentum shift. The Pioneers seemed to wake up temporarily to start the second quarter. At 13:46 in the second, less than two minutes into the period, Tyler Pace scored off an assist from Erik Adamson against Providence goalie Peter Badgley. Then, less than a minute a half later, Wesley Berg found the back of the cage off an assist from Zach Miller through some traffic, making for an exciting goal. This was followed up a minute later with another Tyler Pace goal unassisted. Just like that the game momentum was back in the grips of Denver, but the joy felt in the stands would only be there momentarily. The game went back to back and forth excitement. Aggressive ground ball battles, loud checks, and commanding defenses against pressuring offenses made for edge-of-your-seat moments. After seven minutes of this gripping suspense, Providence started a scoring campaign all over again. They played a more personal offense, allowing any offender with the ball to take it if they thought they could. On the one hand, it seemed like selfish play, but on the other it consistently pressured DU and the Friars still made good passes. With 4:31 left in the half, Will Mazzone scored for Providence, and did the same again 90 seconds later. Another two minutes and change later, Michael Perettine put one past LaPlante. DU responded with a timeout to get their bearings. Tierney must have shared some special encouragement with his squad as usual, because the Pioneers came back to the turf for the second half fired up. If LaPlante running out to shoot wasn’t a pivotal point in the game, Denver’s next scoring campaign would be. Wesley Berg was assisted by Connor Cannizzaro for a goal less than a minute into play. 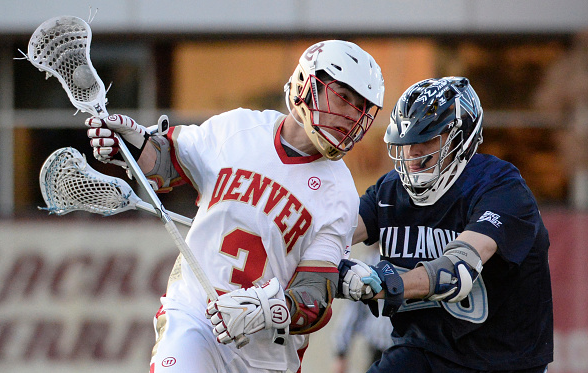 Connor Cannizzaro immediately followed with two goals of his own at 12:16 and 11:13 in the third quarter. The first was a return favor from Berg, the second unassisted. Trevor Bapiste added to the excitement by winning his own face-off and taking it all the way unassisted at 11:04, and Connor Cannizzaro found the cage again with 9:58 remaining. Providence would call a timeout this time to find their heads in the chaos. The Friars’ timeout seemed to pay off when Joshua Keller scored for them just a minute after the fast break goal from Baptiste, But Erik Adamson had an answer for that With 4:48 remaining. Keenan Assaraf started the final quarter scoring for the Friars with a goal just over thirty seconds into play. DU had four answers for that: Zach Miller off an assist from Wes Berg, Tyler Pace off Zach Miller on a man-up play, Berg off Colin Woolford, Miller unassisted. That brought the scoreboard to 13-7 with just under six minutes remaining in play. It wasn’t enough for Providence. Though they would go on to score two more goals, the momentum, time and energy were all taken from them by DU. Final Score: Denver wins 13-9. Little kid approximately 6 years old wearing the Colorado Mammoth helmet of #19 from the night before there to watch DU win with his stick in hand. Cheerleaders and dance team for DU, who were bringing the cheering excitement when the fans tired out. Ryan LaPlante and the DU defense for shutting down the majority of Providence pressure and shots.